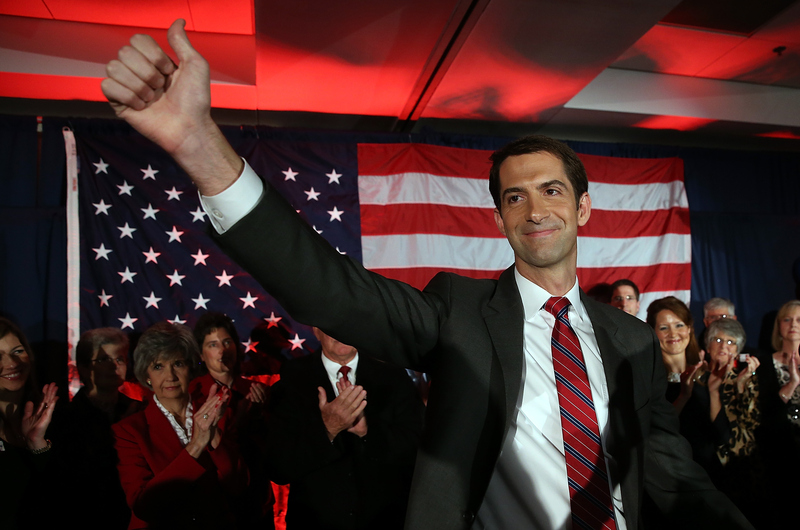 Who Is Tom Cotton, The Possible GOP Presidential Contender You've Never Heard Of? The man whose minimalist signature is the first to adorn a letter sent to the Islamic Republic of Iran might very well be a Republican frontrunner for the 2020 presidential election. Sure, it's a long ways off, but Arkansas Junior Senator Tom Cotton is a possible presidential 2016 contender, and he's already making a big splash on the national level. Cotton and 46 Republican senators ranging from fellow newcomer Bill Cassidy of Louisiana to senior Senator Orrin Hatch all signed an open letter to the Iranian government explaining presidential term limits and legislative voting protocols in a surprisingly passive aggressive attempt to thwart current nuclear negotiations with the United States. Tom Cotton would be my current idea of someone who should be afforded this opportunity. Politics, if I've learned anything, it changes every day and there could be the great next hope show up tomorrow but I don't think it's reasonable to say I wouldn't be looking at Tom Cotton to have that opportunity. Ambition characterizes and distinguishes national officeholders from other kinds of human beings. Inflammatory passion and selfish interest characterizes most men, whereas ambition characterizes men who pursue and hold national office. Such men rise from the people through a process of self-selection since politics is a dirty business that discourages all but the most ambitious. The impracticality of such rigid fundamentals makes Cotton a purely idealistic candidate within the vein of Rand Paul, whose initial arguing against vaccines during the fever pitch of the measles outbreak felt less like a shirking of sound medical advice and more a true buying into the purest form of libertarianism's social freedom — that individuals should have a choice no matter the consequences. Despite Cotton staying true to his beliefs in the face of helping to pass necessary funding for FEMA or his signature singular dedication honed precisely to keeping Gitmo detainees exactly where they are, Cotton has proven himself as a standout, if not boisterous, candidate for the Republican party to continue to thrust into the spotlight. Cotton, just 37 years young, is the yawping, incoherently enraged voice of the people, after all. He's the man who falsely claimed that ISIS was working with Mexican drug cartels and lied boldfaced to voters about his decision to vote no on allowing $300 million in funding to reach the Arkansas Children's Hospital, while also lashing out at Democrats and claiming that next they'll be saying he hates puppies. Cotton is the ideal politician in the age of Fox News, which is just as delusional in their defense of Bill O'Reilly by attacking the "liberal media." If the GOP has nowhere to go but insane, they've made the right choice in putting their faith in a man so unconcerned with reality such as Cotton.